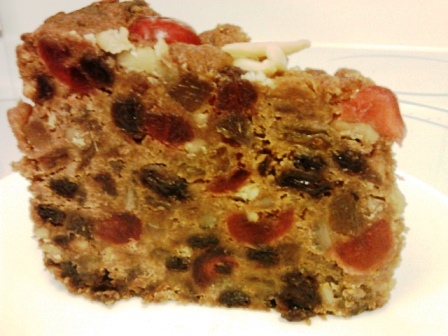 As I mentioned in my previous post on the fruitcake tasting, my friend Laura's contribution to the event was a homemade fruitcake using the Fiona Cairns' recipe. You can see the beautiful results below; my friend Laura is an excellent baker and, evidently, food stylist, as she made the cake look gorgeous. Tamarind paste brings a sour, fruity note to food. I know that may not sound terribly pleasant, but it's an essential component of Indian cooking, used to offset heat or sweetness, really just as a counterpoint to the other flavors going on. And I feel it's an essential component to the deliciousness of this cake. Because it was, indeed, delicious. 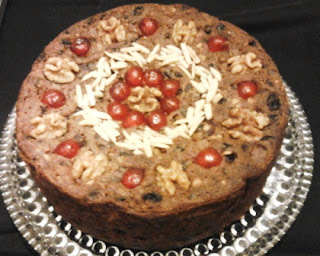 It contains cherries, currants, and gold and dark raisins, as well as walnuts and almonds, well distributed throughout the cake. The cake itself is rich and spicy, containing almond flour, orange, and lemon peel as well as crystallized ginger, all adding to the complexity of the flavor. Plain ginger would add one note, I think, but crystallized ginger adds a flavor and a texture that steps it up a notch. Laura tells me she followed the recipe faithfully (as she does any time she tries a recipe the first time), but admits that she may have rolled just a bit more crystallized ginger into the mix. I don't care--I can eat crystallized ginger like candy. A strange ingredient in this recipe, I think, is "apple pie spice." It just seems very un-British. Basically, it's cinnamon, allspice, nutmeg, and ginger. I guess I'm a spice snob, and prefer to have my spices individually named. Interestingly, though, "apple pie spice" describes a specific flavor profile, different, say, from "pumpkin pie spice," which contains cloves. So there you have it -- you have an apple pie spice profile in this cake, augmented with the citrus rind and crystallized ginger. And of course, there's booze -- brandy (Laura used cognac). The fruit is macerated in the brandy, along with the tamarind paste, which will definitely impart a different flavor to the fruit than if it were just soaked in brandy alone. And after baking, of course, the cake was fed with brandy. The cake we tried was a young cake--only about a week old. Before I get into the taste of the cake, I should call out one other unique ingredient - bitter orange marmalade. Yup, in addition to the orange peel, lemon peel, oh, and I forgot, there's mixed candied peel in there as well, which Laura said she bought from King Arthur Flour. It was a challenge for Laura just to collect all these ingredients, and I've heard that from other fruitcake bakers--maybe that's why there are so many commercially-made fruitcakes. People just give up! Anyway, back to the marmalade, just another addition to the macerated fruit which imparts another layer of complexity to the flavor of the cake. On to the flavor. This cake was delicious. It reminded me of a salted caramel, a combination of richness, sweetness, and a spice/salty edge. The scent was boozy, sweet, spicy. The cake was moist but not wet, rich, and sweet. There was this note of spicy, buttery saltiness to it. Again, I know that sounds weird, and let me assure you it tasted like sweet fruitcake, but that additional note, just like the salt on a caramel, enhances the underlying sweetness and makes it that much more delicious. What can I attribute this note to? I think it's a combination of the crystallized ginger and the tamarind paste. The crystallized ginger imparts a warm spiciness when you hit a piece. Worcestershire sauce also contains tamarind paste, and it's often used to add a deep savoriness (maybe one would call it umami?) to dishes. I think that tamarind imparts a certain je ne sais quoi to this cake, which makes all the difference. And yeah, I went there - referring to Worcestershire sauce when talking about a fruitcake. I don't know if that comment will win any fruitcake converts. But regardless, this is a fabulous cake recipe, which I recommend! I never knew how much when into making chocolate fruit cake. thanks for the information.